Of life and love and all that is good. One who cared more deeply than we will ever know. But he is gone – and oh the difference now! Yet somehow richer because of his life. One day we will meet him there – never again to part. And a worthy example to all. 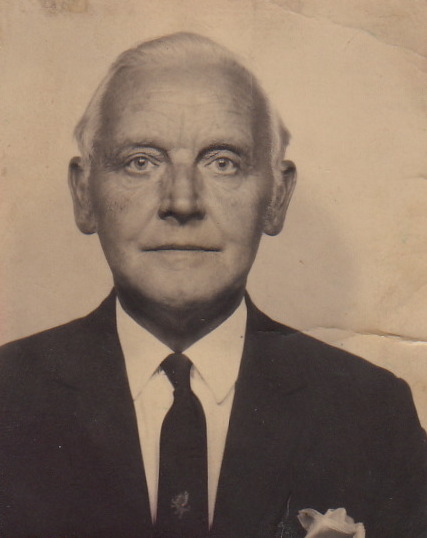 Composed in memory of Jean’s dad Joseph Ainsworth Musgrove. A lovely man. Forever loved by all who knew him and adored by his wife to this day. I’ve always loved the first two lines especially, because those words echo what I think about sharing my life with the lady of the house whose company I love each day. Today though, I found myself singing them to Alfie as I was watching him play early this morning. Another sleepover, and this meant seeing him from first light. People have begun to ask me, “What are you doing with Alfie next Friday?” and I always tell them the same thing, that we’ll see what the day brings and as far as Alfie is concerned that song sums it up… ‘What we plan to do….Knowing anything at all’s OK! Whatever I do with my little friend is great and we’ll enjoy it together. I spent yesterday with my old friend Mick and we had been reminiscing about the happy days we spent in Barry Island when he was on the Beach Missions. It gave me the idea for today’s adventure. By the time we left home Alfie was on nappy number three for today! We called in on Alfie’s cousins’ house on the way to pick up my SD card. I was hoping for an invite in, but Mia and Millie were entertaining Lily their little friend from Bethesda, so I didn’t push it…looks like they were having great fun though. I had invited Bes along with us today, she was at a loose end and I thought she’d enjoy one of our fun days together. Through many of her teenage years Bes and I had set aside Wednesday as ‘our night’ and I will always treasure the happy memories of the times we spent together, sharing cups of coffee, revising for exams and just chillin’ together. 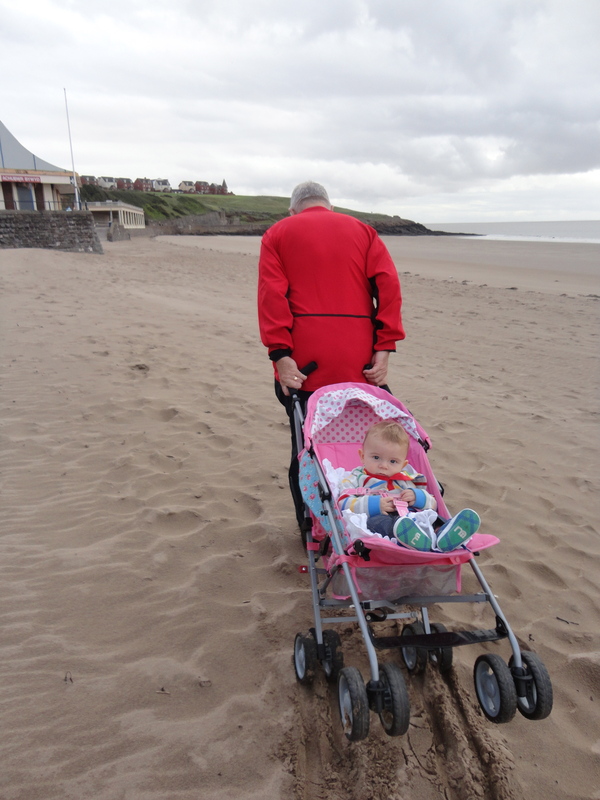 So we made our way to Barry Island for todays adventure. The lady of the house has given me grief all week for calling Penarth a slightly seedy place, so today we were headed for the jewel of the Glamorgan Heritage Coast, the upmarket, beautiful coastal town of Barry, a town richly steeped in history, a place of unrivalled beauty, full of picturesque sights and interesting places to visit. The Island was quiet as we arrived. We parked next to an elderly couple who were visiting from Colwyn Bay. The chap said that he was disappointed that everything was so run down and had so obviously lost its former glories… ‘slightly seedy’ immediately sprang to my mind, so did the face of the dear lady I love, so I pushed it away again! I am immensely proud of my home and all things Welsh but Barry Island sadly is in need of a huge amount of tender, loving care and attention. I blame Cardiff for it all of course! From the mid seventies till quite recently, we lived in South Glamorgan, which included Cardiff and the Vale of Glamorgan. It was the time when Cardiff Bay was regenerated and it is wonderful, but sadly Cardiff took all the money for the Bay and for many years, pretty little towns like Penarth and Barry were neglected and what we have today is the legacy. Now, for the past few years, we have a Vale of Glamorgan council, let’s hope they can restore these towns to how they used to be. 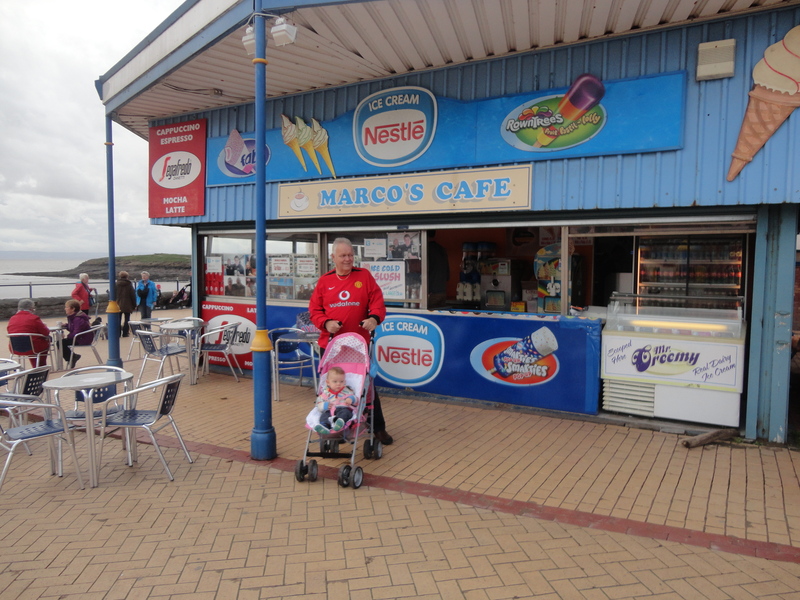 Our first stop was Marco’s the coffee shop featured in Gavin and Stacey, that well-loved television series. We decided not to stop for a drink; it was not the warmest day and there were a couple of dogs sniffing around the tables and one of them took the opportunity to relieve itself on one of the tables. Marco was oblivious, too busy dreaming of lattes and cappuccinos! We strolled along the promenade, which was actually rather nice. The beach was deserted except for some people with metal detectors looking for buried treasure. I reflected that I was richer than them all in that I had some thing far more precious with me at that moment… a little grandson whom I love dearly and a beautiful daughter, who makes me proud every day of her life. 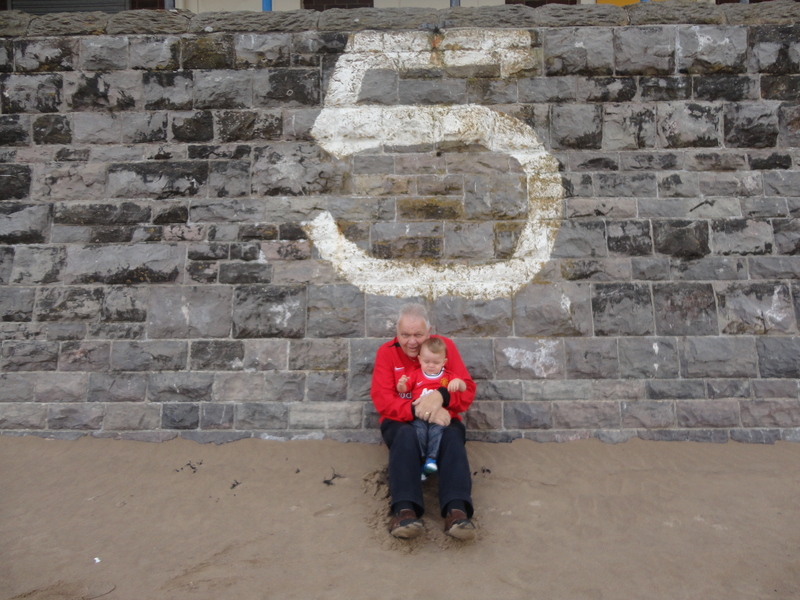 When we arrived at Number 5 of the sea wall, I thought of Mick and Clive and the beach missions and the many trips I had made to Barry as a young boy. We used to travel by steam train from Llanishen Station to Barry Island. We used to hold our breath as we approached Cogan station, as there were two ways the train could go. If it went via Cogan, Dinas Powys and Cadoxton we would be on the beach in no time, but if it took a left turn and went through Penarth, Alberta Place Halt, Lavernock, Swanbridge and Sully, the journey seemed to take so long. I would pay a small fortune to travel that route again today, but sadly part of the line has been built on, so this is one dream that will never come true. I walked the line from Barry McDonalds roundabout to Penarth a few years ago; it was a wonderful experience. Many of the bridges are still there and I think Lavernock platform is still standing but it’s all overgrown and neglected! 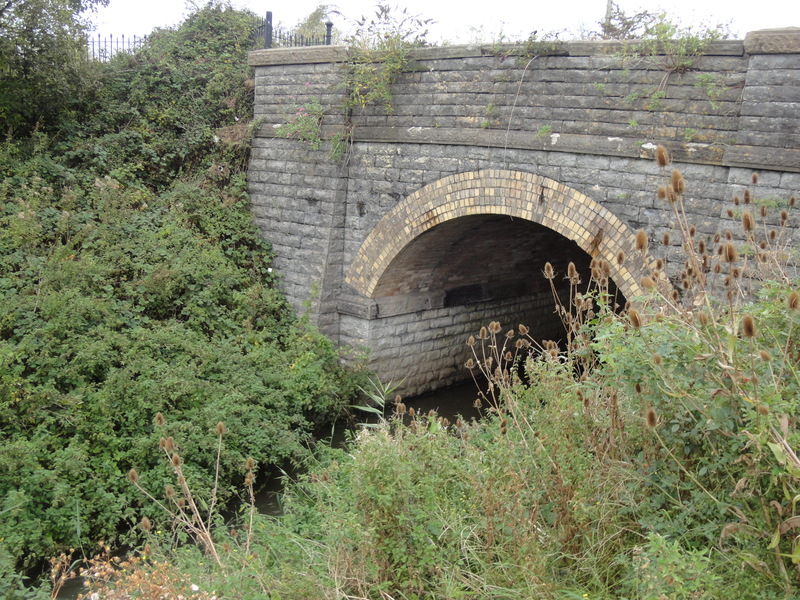 My next mission is to walk the Wenvoe tunnel, a mile long piece of engineering which runs under Culverhouse cross. While I was thinking back, Alfie was busily tucking into the sand. I reminded him that sand which is on the beach and sandwiches in his lunch box were not the same. He smiled knowingly through two very gritted teeth. We made our way up to the fairground; it was sitting there sadly, gates locked; no children having fun, no teenagers showing off and eyeing up the girls. 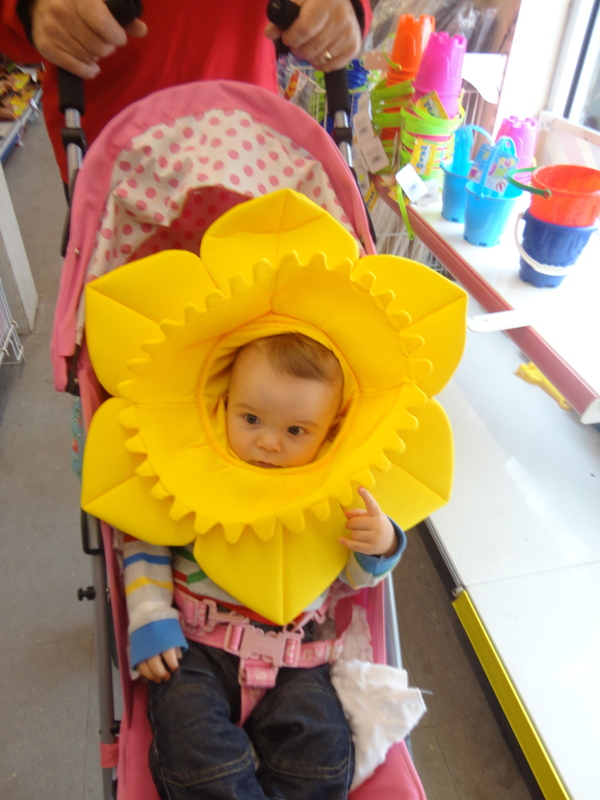 Our sadness melted away though when we realised Hyper Value, one of the original ones, was open, so we had a quick look around and dressed Alfie up in a daffodil hat. Worryingly he seemed to like it, just like he seemed to be enjoying the pink pushchair! Hmmmmm! 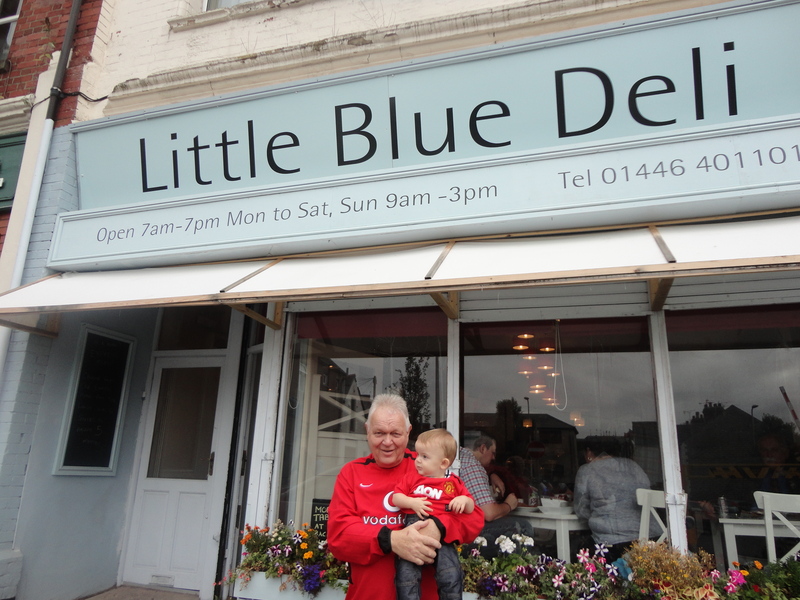 It was getting close to lunch time so we all agreed to would try The Little Blue Deli in Barry’s Thompson Street. When I was in college in Barry, Thompson Street was the red light district, now though only a blue light shines in that infamous street. We drove up into town to the one bright spot in that dismal place. It was very, very busy but we found a seat but had to wait for a high chair for Alfie. While he waited, he amused himself by throwing the sauces and sugars all over the table. The lunch Kate had prepared for him looked so delicious. Home made Cottage Pie followed by an apple dessert. Bes and I treated ourselves to a Panini, so the three of us left, well-fed, well looked after by the owner and ready for The Gavin and Stacey Tour. We visited the house where the television series was filmed, had some pictures taken, looked admiringly across at Uncle Bryn’s house, before making our way to Coconuts a soft play centre near Sully. Alfie was getting excited. As we neared Coconuts I nearly wet myself. Thankfully my prostate is still fine and I don’t usually need Tenna for Men pads, but as we pulled off the road which leads from Barry to Sully, we had to drive up a little slope and actually cross one of the bridges on the old Barry Railway line. I paused on the bridge, closed my eyes and I was back in the fifties, train window open, the smell of the smoke from the engine, the whistle blowing. Bes and Alfie were rolling their eyes impatiently. This was my second soft play centre of the week. I got in free because of the white hair and the fact I had a bus pass. We paid, Alfie had nappy number four of the day, and we set about soft playing. It was fun, although Alfie needs to crawl a bit more before I will feel I get my full £1.50s worth. His little 360-degree bum turn is cute but doesn’t get him very far and doesn’t get him to many of the toys. We tried the ballpark…. but that that was Alfie’s worst experience of the day. The place was full of pretty young things…and some not quite so pretty young things all doting on their little darlings. Some smiled at me and Alfie, as we were both wearing our Man Utd tops, but when I looked in the mirror I noticed my gold chain was hanging outside my top and I was looking decidedly like a Barry Boy, I decided that perhaps that was the reason for the smiles not my gentle relationship with my grandson. There was one other grandfather there or else he was a dad who had received a surprise later in his life! I was glad of Bes’s company today, to be sure! Coconuts was OK, but after Cefn Mably didn’t really light my fire. Alfie was yawning and I knew it was time to cross once again the old Barry Railway line bridge and head for home so Alfie could sleep and dream of his day. When we arrived home I went to give Alfie a drink before his nap and my whole day fell apart. I could see the divorce papers arriving through the door of my one bedroomed flat. I could hear the divorce lawyers licking their lips mulling over the instructions they had received from the lady of the house. 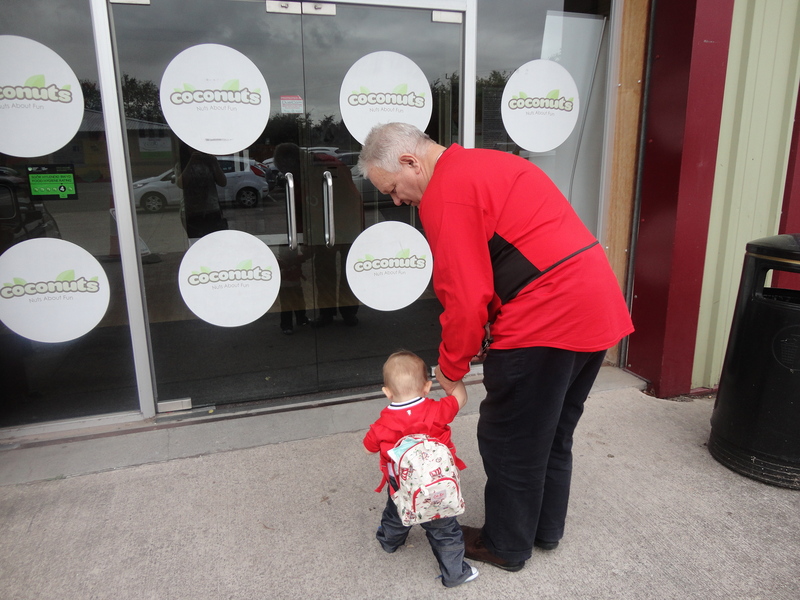 I had left Alfie’s Cath Kidston bag in Coconuts! I was devastated. Bes sat me down, bathed my head with a cool damp cloth and made me a cup of hot sweet tea before hot tailing it back to Coconuts on a quest of immense significance! I could hardly breathe till the phone call came…Bes’s voice was quiet but assured…”Dad…I’ve got it.” All this time Alfie was sleeping peacefully, unaware of the terrors his old grampy was suffering. I hope no one reading this breathes a word of any of this to the dear lady who shares my life. Losing a Cat Kidston bag? I shiver uncontrollably at the thought. I went to check Alfie and whispered the good news of the bag to my little sleeping friend. His flickering eyelids seemed to say…What’s occurin’ grampy? And I knew the day had not been in vain! Adventure with the girls – The Magical Mystery Tour! I had set aside today for getting my application ready to start doing some supply teaching work, but Mia has been looking at me lately implying that she has been reading Adventures with Alfie with a hint of ‘When are my adventures going to happen?’ The truth is we have had loads but never recorded them until now. Last week I promised Mia and Millie that I would have a word with the lady of the house and sort it out for this week. When we agreed on today, it was all set up for a sleepover followed by the Great Magical Mystery Tour. I had ideas in my head but needed to check out the day first as the place was new to me as well. The girls woke early; Millie had her morning drink and snuggled back under for an extra half hour. Mia always sleeps with Bes in her double bed. John Denver once sang about his Grandma’s Feather Bed. Bes’s bed, too, is legendary and Mia always shares it. John Denver’s song says ‘Didn’t get much sleep but we had a lot of fun in Grandma’s Feather Bed… and I suspect from the oft heard giggles after ‘lights out’ that Bes and Mia always enjoy these times! Today though Mia was despatched early to let Bes catch up with her beauty sleep. So, Mia came in to wake me up – I was faced with a choice – send her back to Bes’s bed, send her to the nursery to have a bit more sleep there, or get up and have some fun. The opportunity to spend some fun time with my eldest grandchild was too good to pass up! I had a good scratch and a cough and I was ready for what this brand new day could offer. Mia and I had some toast to keep us going till breakfast and proceeded to make the lady of the house her first cup of tea of the day. Many years’ experience has taught me it pays to keep the dear lady happy. Mia and I tried some early morning TV but all those presenters calling everyone ‘guys’ and sounding so energetic and cheerful put me off, so we settled for a viewing of the old Disney film Pinocchio. We both loved it, snuggled under a blanket, covered in toast crumbs yet blissfully happy. The song “There are no strings on me…’ reminded me of Mia. She is becoming so independent lately and turning into a lovely young girl, full of questions and starting to ask ‘why’ after every question or request. I love it… she is so delightful and I treasure the times I spend with her. I have many lessons about life to share with her. Millie in the meantime was enjoying her cuddles and preparing for the day. Millie is so wonderful, the sweetest, gentlest child imaginable who is becoming a big rival to Alfie in the smiles department…. and that takes some doing!!! Her piercing blue eyes are striking and add to her beauty. We were in for a great day. Today though was different…very different. 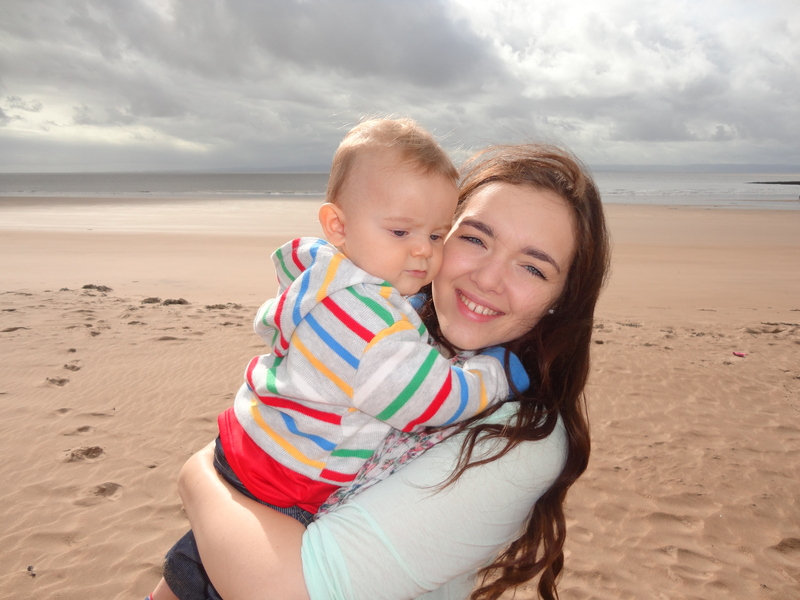 Adventures with Alfie are just the boy and me… quick bread and cheese wedge; spare nappy and we are off. Adventure with the girls means the lady of the house has to accompany us… so it was breakfast, and then an age waiting for her to prepare everything Cath Kidston! There was a Cath Kidston rucksack for each little darling, a Cath Kidston baby bag with nappies, cream and a spare of everything, a Cath Kidston cup and bottle and I am sure even Cath Kidston dirty nappy bags. I am certain in my mind that the dear lady was about to call me Cath… before correcting herself, regaining her dignity and saying ‘Fatboy, get the Cath Kidston pushchair in the car and be quick!’ Quiet obedience followed! I had prepared a CD of kids’ songs for the journey and we set off singing merrily about the Wheels of the bus going round and round. It was great fun. When we sang about a Flippy Floppy scarecrow, I felt quite sorry for him. I began to wonder how old he was and if anyone cared for him in his flippy floppy state. I nearly caused a multi vehicle pile up as we headed over the Cogan Flyover. We were singing ‘If you’re happy and you know it’, when verse four came on and at my age I’ve got to say I found it quite difficult to clap my hands, stamp my feet, nod my head and goodness knows what else, whist negotiating the mid-morning traffic. I think I just about managed it. We were headed for Cefn Mably Farm; it was so lovely to hear Mia singing along to all the songs. When It’s a Small World came on the lady of the house and I exchanged knowing glances and without words being used we both agreed, just with a smile, that another visit to Paris is long overdue! I had my journey planning spot on because as we approached the farm, the car CD player was playing Old McDonald had a farm… perfect timing. We didn’t really know what to expect but it turned out to be a kids’ paradise! I have always thought much about the difference between being childish and being childlike. I firmly believe, even when we are grown, if we can retain a child like outlook on the world we will enjoy life so much more. Forty years in teaching helps me look at the world through a child’s eyes and I was as excited as Mia and Millie as we arrived and saw this big transit van painted pink with ears on top and a tail behind. How cool was that! Sadly for me though, in my life, I was too often childish and it got me into trouble far too often. I remember time I was about forty five and drove into a ditch while playing air guitar to Bohemian Rhapsody at full volume or the time I broke the church organ doing what I thought was a fantastic imitation of Lurch from the Addams Family. You will be interested to know I am slowly beginning to settle down. Cefn Mably Farm has a large indoor area containing settees and tables and chairs, a large café serving both drinks and hot meals. 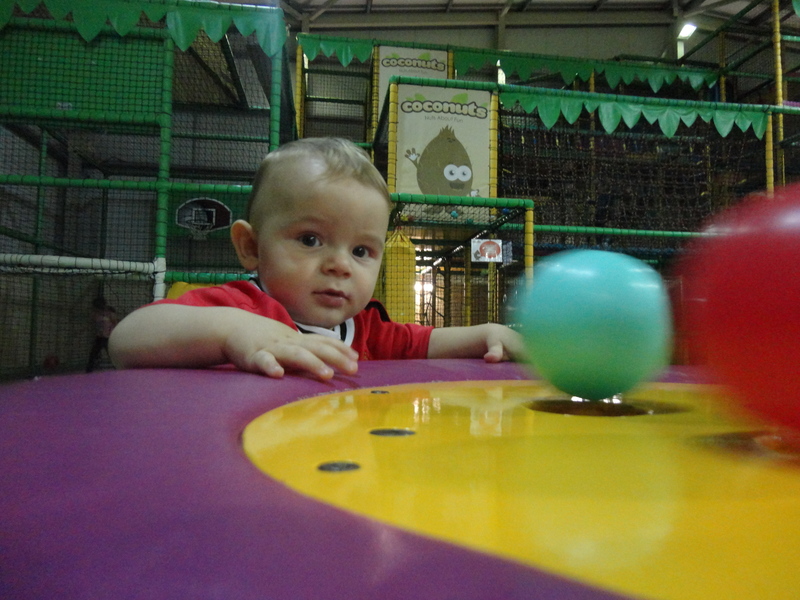 It also has a fantastic children’s soft play area, with one section for the fours and under and another section for the over fives. There is also a covered outdoor section where there is a range of farm and domesticated animals in clean pens. Mia was beside herself and let us know it was the animals she wanted to see first. We had already bought a bag of food and she was off! She adored them all, from rabbits to guineu pigs. There were goats and sheep and even three little pigs in one enclosure. As we were looking I was reminding Mia and Millie of the story and true to form as I was telling the story one of them did ‘Huff’, another ‘Puffed and the third one blew off judging by the awful smell that surrounded the enclosure. At one place Mia was invited to hold the rabbits and guineu pigs, which she did lovingly and with great care and patience, staying there until one particular little black creature finished a whole piece of carrot! There were also some pedal tractors there, free for the kids to use. Mia was in heaven! Millie too enjoyed looking at the animals, not quite sure what to make of some of them. Outside, there was an open area with some tiny horses, Shetland ponies and some more sheep and pigs. Then the big challenge came when we saw a sign announcing…. horse rides £2 a go. Mia had no idea what we were suggesting I am sure, but willingly agreed to a horse ride. I paid my two pounds, she donned a hard hat and looking somewhat unsure went on this ride on a tiny horse that looked like something out of the 2012 Barbie Annual, with its bleached blonde mane and fluttering eyelashes. She was wonderful and overcame her fear with grace and a dignity that belied her years. Wonderful memories! We scrubbed our hands, as instructed by the signs, and made our way to lunch. Millie was starving and ate straight away. Mia and I headed for the soft play area and boy did we have fun! We had to juggle a bit with a bit of bending and pushing but I did eventually get my head low enough to get passed the height restrictions. After lunch Millie joined us and we had a wonderful time. Millie was so lovely crawling around and playing so well with all the equipment. At one time a little incident happened which caused me to smile. A young boy aged about four came into the ball pit and in the course of their play, picked up a ball and threw it hard right into Millie’s face. Mia was shocked, but lovingly put her arm around her little sister, made sure she was okay and then proceeded to tell the boy not to throw balls at her sister’s face and showed him how to throw the ball away from her. It was a touching little moment that would have been easy to miss but caused me to reflect that as they grow up together these two beautiful little people will need and support each other and I have no doubt Mia will be the most marvellous big sister to Millie. I will watch them grow with interest and much love. As I sat there up to my knees in balls and coloured cubes and I just thought that if we try hard enough, even ordinary days can become adventures if we just take time to look through the eyes of a child! As we made our way out of this lovely little place Millie fell asleep between being lifted out of the high chair and being placed in the pushchair. Mia just made it to the car before slipping gently into her dreams. Both slept soundly, both with smiles on their face and happy memories of an ordinary September day when together, we made special things happen. No singing on the way home, although the lady of the house and I kept the kids CD playing all the way home. It had been a magical day. As we drove along the road towards St Mellons my dear one gazed with great affection at our sleeping girls, then looked lovingly across at me and said ‘I think I’d like an old goat? I tried not to looked puzzled… I thought she already had one! Mia and Millie may not remember this day, but there are two old people who will and one of them is putting an application form for supply work back in the drawer. Brings a peace all of its own. The marvel of becoming a father is that something so commonplace can be something so special. An event, which happens to tens of thousands each day from east to west, north to south of the globe, is a happening utterly unique. It is a wondrous experience to be a witness at the birth of a soul. Just as his coming is unique, so too is he as a person. Never before has there been a personality just like his. Never again will, there be a life lived like his. He will be shaped by the world in a way that no one else has ever been shaped. He will shape the world in a manner inimitable. It is strange that in an age where the uniqueness of the individual has never been more closely perceived, respect for the worth of an individual is at such a low point. Commitment to material prosperity as life’s goal must, I suppose, have, as a direct consequence, the decline of growth in the human spirit. Perhaps the birth of a little son makes one especially reflective. Of course, we asked ourselves before Gareth was born, whether it would be fair to bring a child into today’s world with its threats of tomorrow. What kind of world will it be in ten, twenty, fifty years’ time? Will it be better or worse? We wanted Gareth to be born because we believe that he, and we, can play a part in changing the world; because we believe that is the destiny of each human life. But there is something that goes through my heart even more deeply than my hope for the kind of world we would like for our son. That is the quality of life we would like our son to live. For I know that whether or not he will be a fulfilled person, whether or not he will contribute to making the world a better place, depends not on the world around him but on the spirit inside him. Our lives are not meant to be reflections of modern trends, bearing the stamp of someone else’s glib ideas and worthless fashions. I long for him to find true independence and freedom of heart, which come in their ultimate from a commitment to serve God and from the priceless gift of faith, solid as a rock in a sea that ebbs and flows. What other gifts would I like my son to have? A sense of humour and a sense of fun, worth their weight in gold. A vision and a view above and beyond the immediacies of life. Courage. And above all a love for God and people. It is perhaps natural for a father to want for his own son the qualities he feels he himself lacks. Of course, I cannot give them to my son. I cannot even compel him to go looking for them. That is his choice and in the end they are God’s gifts. But I can at least decide to live in a way that helps not hinders, him along the road. And peace fills the room. But my heart will rejoice for ever! It isn’t the burdens of today that drive men mad. Rather, it is regret over yesterday or fear of tomorrow. Regret and fear are twin thieves who would rob us of today. “For this cause shall a man leave his father and mother and shall cleave to his wife: and they shall become one flesh. Yet destined by Him to meet. One family – safe in the hands of God. The pretty girl I married is a beautiful woman now. Thirteen summers, when our love has built memories time will never erase. How good life has been since first we met. Each one a beautiful flower in God’s garden of life. And a joy beyond compare. The start of the adventure..the first Autumn. Today, for the first time, K8 and Jas trusted me with the little miracle we sometimes call Alfie. K8 has gone back to work part time and I have agreed to care for Alfie on a Friday while she & Jas are working. Big responsibility…but also big opportunity for fun and adventures together. Been thinking… as Alfie was born in Cardiff I thought I had better get to work introducing him to the wonderful city of his birth. So today we took our first trip into Cardiff alone together. I think we were both excited as we boarded the train from Eastbrook – I decided on the train in case the bus pushchair space was taken and I had to do a quick fold up on the first day – and made our way into Cardiff. I think he’s going to like trains as he smiled all the way in!First stop of course was The Hayes Island Snack Bar where we sat and watched the Paralympics on the big screen. I toyed with the idea of a bacon roll, the smell wafting over the pigeon droppings was so tempting. Then the flashbacks started and I remembered the encounter with the seagull in October, so today I gave it a miss. I think Alfie enjoyed it here, he smiled all the time! After some time here we moved on to Ashton’s the fishmonger in Cardiff Market. He was amazed at all the ugly faces on display, but shook his head when I offered him one of my cockles…Hmmmm, some work to do there. I had already asked for ‘the usual please’ when the girl with the broad Caaardiff accent asked if she could help. I think Alfie liked it here, he smiled all the time! We strolled around the market and I showed Alfie where he could buy a pig’s head or an ox heart when he was bigger, he didn’t seem all that interested. All changed though when we took the lift upstairs to look at the pets! He loved the budgies and the rabbits. I thought about surprising K8 and Jas with a mouse or a rat, but thought better of it. One shop had an albino rabbit…I thought…albino, you can’t say fairer than that! I think Alfie liked it here he smiled all the time! By now it was getting close to food time. I want to help bring Alfie up proper like, so I decided today not to have a bacon roll in the market with the real Caaaardiff people but to go to Howells, where I felt I would have a better chance of a high chair and my tea in a pot instead of a polystyrene cup! On the way to my usual haunt on the top floor, I saw a sign, which said Café Zest, so I tried it! What a find! Plenty of space and definitely a refined clientele. It was like Fifty Shades of Grey, with all the old dears there. I think I was the youngest by a few years. Alfie wowed them all with his smiling and giggling. Big bonus…. they had a bacon roll and a pot of tea on special offer. I was in heaven. I ordered mine and a rack of toast for the little ‘un and we spent a very pleasant hour with the blue rinse brigade who all left talking about my little miracle! Perhaps that’s why it’s called the Café Zest, these old grippers has a certain zest for life and were great with the little man. We made our way back to the station meandering through the Cardiff Arcades and the charity shops in Central Square and bought a beautiful shirt, Bargain! I think Alfie liked this part of the trip as he smiled all the way! We arrived home mid afternoon, looked at each other, shook hands and agreed… Fridays are going to be fun! I understand that Alfie hasn’t slept too well for the last couple of nights…he must have been getting excited about Adventures Day 2. It started with a sleepover. Great news for us and Boo especially, as she got to see more of the little man. He had his bath and supper and then went to sleep in the nursery…that little bit of kid’s paradise that the lady of the house has set up for our grandkids…and a load of other kids too! … to enjoy. It’s a beautiful little place for the wonderful little people in our lives. The latest addition…a farmyard complete with a load of animals is going down a treat, well worth that early morning visit to Splott Mearkatt, to visit our old friend the ‘toy doctor’. She’s a lovely lady who rescues and renovates toys. Alfie had a good sleep and was awake early. My mum was always a very positive person and one thing she always taught me was ‘rain before seven…sun before eleven, so when we got up today and saw the rain lashing down, I wasn’t too bothered: I just looked and the great lady’s photo on top of the cupboard and smiled…so did Alfie. He, like me, was looking forward to a great day. By the time the lady of the house had been taken off to work, the blue sky was just breaking through. As soon as we got back to the house, Alfie smiled – not because he was happy, but because he had got me! The smell gave the game away… a full nappy this early. I was torn, what a choice, eat my bran flakes first and then change the nappy or change the nappy, then maybe not feel like bran flakes. The nappy won! I remembered the early years of fatherhood… remove all you can with the nappy, then wipe with a wet wipe…but disaster Boo – had gone to work without leaving me any wet wipes. Fortunately I remembered that I always keep a supply of Andrex Wet Ones near the loo for when Princess Mia is in attendance. After a few minutes looking for a nappy pin, before remembering they were disposables, I had him back clean and tidy. Job done, Alfie comfortable, and I still managed my bran flakes! Nap time followed and while he was asleep, I played that game that all mums play at this time – see how many jobs I can do before the precious little darling wakes up. I got most of them done today, in order of importance – check Facebook, check e-mails, have a quick look at Sky Sports news followed by the BBC news, quick visit to The Jeremy Kyle show, followed by make the beds, tidy the lounge and wash the breakfast things. I only failed on the final one. I lied about the quick visit to Jeremy Kyle. I love watching it all…open mouthed and bemused most of the time! After Alfie’s morning nap we were set to visit Cardiff Bay and the second chapter in his education of the wonderful city of his birth. I thought about the bus, but to get to the Bay, it’s a 95 into town then a Bendy Bus to the Bay, so I went by car. We parked near the Coal Exchange and I showed Alfie the building and explained that it was where the world’s first £1million cheque changed hands. He smiled and I thought about the nappy and moved quickly on. I took him down all the narrow passageways, where in years gone by, in the days of Tiger Bay, they were places where you would not have dared venture alone! It was fun. We made Mermaid Quay and it was a beautiful day. I looked up and was sure I sensed my mum smiling down. It was just before eleven. Oh how she would have loved Alfie!! Although this side of heaven she will never see him, she knew one day God would hear K8’s prayers – and He did – and bless her and Jas with a little one to call their own. None of us could ever have imagined anything as beautiful and I have him all to myself once a week. Priceless! As we strolled peacefully across to the Millennium Centre, Alfie was taking it all in and smiling at every single passer by. I am sure every single passer by smiled back – this little fella makes the world a happier place. The Oval Basin was a hive of activity and it appears there was a Car Rally or something on. I am sure Alfie was thinking ‘Find me a rally car grampy’ but all we managed was a big picture of a rally car, where we had a photo shoot and a load of huge lorries. I got chatting to a street entertainer who claimed he could make balloon animals whilst riding on a monocycle…I said to Alfie “He probably makes thing up as he goes a long.” Alfie smiled. Next we made our way passed the Welsh Assembly Government building, once the domain of Chris Franks but now a quieter less interesting place. We were aiming for the Norwegian Church where Roald Dahl was christened and his family attended years ago. I am just longing for the day when I can sit the grandkids down and read The Vicar of Nibbleswick, The Great Mouse Plot and Mrs Pratchett’s Revenge and many other Roald Dahl stories. I had so much fun reading them to the hundreds of children I taught and look forward to getting ‘Boy’ off the shelf and sharing the treasures inside with Mia, Millie and Alfie! I am sure Alfie liked it here, I could tell! It was getting towards food time, so when we arrived back near Coffee Mania, I was wondering where to go and Alfie flashed a Starbucks card, so Starbucks it was. Annoyingly there was no highchair, so I waited till the leather sofa was free, tucked Alfie into the corner and opened his packed lunch. I had laughed when I made them earlier in the morning I had prepared two pieces of Braces Extra Thick bread with extra thick butter, only to open the fridge and find the two pieces of medium sliced wholemeal K8 had left. Gutted Alfie… but he enjoyed them sat there in Starbucks. The Wales Ladies Football team arrived while we were there, obviously on the look out for that good looking fella they had seen earlier, but I kept Alfie tucked away so they wouldn’t notice him him. Bes took him away smiling. Alfie with his new pet! The adventure today really started the previous evening, when Alfie decided to have a sleepover at our place. The lady of the house was more than happy about this, even though she was running her club for ladies of a larger size at the time. This pleasant weekly gathering takes place at our house on a Thursday evening; it’s a great fight back against Slimming World and Weightwatchers and while it will never become global, the ladies who attend enjoy themselves. The only thing is I have had to ask them not to undress when they weigh, as our Yorkshire Terriers are easily scared! Alfie was delighted to find his little cousin Millie was also around. We are so looking forward to them growing up as cousins and best friends. Their birthdays are just three days apart and this is the nearest we will ever get to twins! They bathed together and had great fun before Millie had to return to Barry and Alfie took to his cot in the kids’ paradise, which is our nursery. When I got up Alfie was already up, dressed fed and looking forward to the day ahead. When I walked in bleary eyed and unshaven, I thought he was going to burst with excitement! I still can’t believe this lovely little fellow is ours. I have a sore arm joint at the moment and the lady of the house asked me how many years I had been suffering with my tennis elbow, I said, “Fifteen love’ then I took her off to work. When I came back, I played with Alfie for about half an hour on the floor. As I watched him quietly playing I just had to thank God for this incredible little human being who has been entrusted to our family. He is a wonderful and unique child. He is not crawling yet but does a mean 360-degree turn on his little bum. While he had his morning nap I got on with the household duties, washed the breakfast dishes, made the beds, tidied the lounge and thought about what to have for tea. I had five minutes with Jeremy Kyle and wondered why the guests were so scruffily dressed; they really must make a fortune from the tooth fairy. Really strange! Alfie was awake just after ten and we got ready to start today’s adventure. Before deciding to go to explore Penarth, I had thought about going to the Alphabet Theme Park but last time there was a huge Q so I decided against it. We set off and made for The Billybanks but when we got there Alfie and I were sad to see they had already been demolished and the place was like a building site… pretty much like it had always looked actually. So we made our way into Penarth. When I was young the signposts always called it ‘The Garden by the Sea’. Sadly these days I feel it’s lost much of its former glory. I drove round for ages trying to find a parking space – it really is so annoying not being able to park with ease – before finding one outside a shop called Dear Doris. I smiled as I remembered my mum’s sister who always thought of me as her ‘special one’. Alfie and I set off and decided to walk through Alexandra Park down towards the beach. It was idyllic, I was thinking that possibly Penarth has not lost all its former beauty; maybe I have just stopped noticing. Alfie and I stopped and enjoyed each other’s company. It was calm and peaceful. As we sat on one of the benches we watched a several squirrels preparing for the long winter months ahead. We saw magpies, starlings and some sparrows enjoying the warm autumn sunshine, busily feeding themselves. There was still plenty of colours in the flower borders and the sound of the nearby fountain made us feel even more tranquil. We sat and enjoyed it for a while, before moving on. As we neared the beach there was a long gentle flight of steps that seemed to go on forever. I just let the pushchair ride the shallow steps and Alfie got a fit of the giggles, it was so lovely hearing him chuckling away. He loved the beach when we got to the promenade. The tide was right up to the sea wall so we couldn’t go on the beach; we had to make for the pier. There were a few old people enjoying the pleasant morning and several luckless fishermen with empty baskets spread out along the deck. Alfie smiled at each one in turn and each one smiled back at the little man. He sure makes the world a happier place. He asked to get out of the stroller here and enjoyed walking up and down the pier. I think Alfie is going to miss out the crawling phase and just start walking; he’ll be doing it without my help real soon. Every passer by stopped and spoke, mums with toddlers, old people with sticks and council workers. He loved looking over into the sea, which was calm down below us. It was then that a bad thought hit me. It was fun walking down from the town but the hill back up was a long and difficult one. I knew there was a bench halfway up the hill, so I planned a phased return to town and Coffee 1! We set off and I am pleased to say that I made it back up the hill, passed the Kymin, without needing to take advantage of the bench and made it to town, a little breathless, a little pale but certainly ready for my coffee and toast. Alfie was singing all the way up…. a little off key but obviously enjoying the hill. I am sure he was ready for his lunch too. The staff in Coffee 1 were great and brought my coffee and my toast to my table while I found a high chair and sat my little friend in before opening the goodies I had prepared for his lunchtime meal. As usual he charmed everybody, including some pretty young things on the next table, who were impressed that Alfie was quietly tucking into cheese sandwiches with the crusts removed, helped by this fat, old, grey haired bloke who looked old enough to be his grandfather, while their kids were causing mayhem with bottles and other snacks being tossed about with reckless abandon. Alfie played happily with this wooden spoon with a face and a number 13 on that they had given to me to enable them to find the guy who had ordered toast. He used the table as a drum before spending an age playing with a Coffee1 take away cup which fascinated him. We had a lovely time enjoying being together before having our picture taken and making our way out. 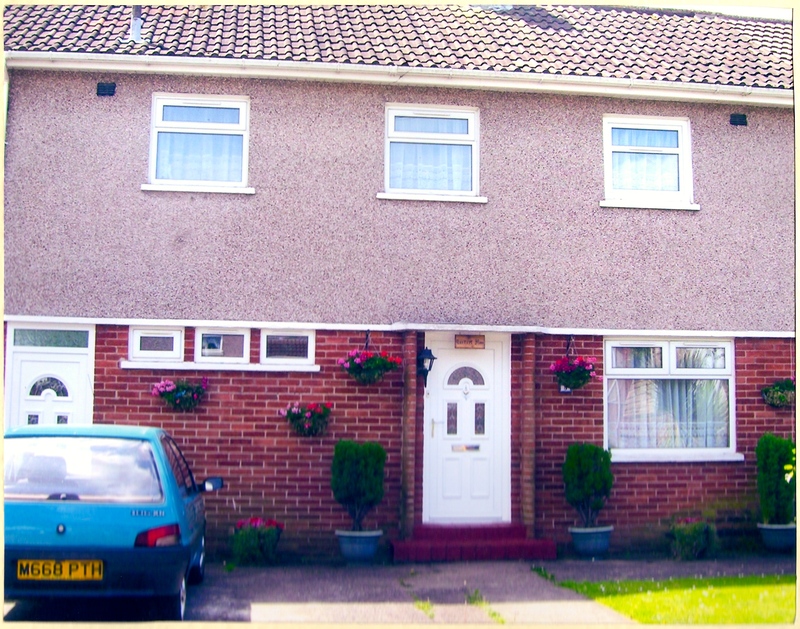 We next made our way up to the home where Alfie’s great Nan – and she really is just that…a great Nan – lives. We enjoyed a lovely visit and the old girl was looking intently at him for ages. I’m sure she loves him and she only frowned when I reminded her that his name was Alfie. She never did like that name, thanks to Alfie Brown the little tinker who lived next door to her eighty years ago in Knowle Street in Grangetown. I began to be aware of a strange but increasingly familiar Friday smell and not being entirely sure which of these beautiful people that I loved so much was responsible, decided it was time to take Alfie home. After kissing her goodbye we headed back, our adventure nearly over. Alfie’s eyes were heavy as we drove back to Dinas Powys. I had to speak to him several times to keep him awake long enough to get him back to his cot. A quick nappy change… sorry I doubted you Beat… and he was sleeping soundly safe in his cot, arms outstretched, with a big smile on his face. Alfie I loved today… thanks for being my friend! Castle ArcadeLoads of good different shops, made a nice change from the usual St David’ s 2 lot. Keeping the promise I had made a week ago to myself I went for a bacon roll and a cup of tea at The Hayes Island Snack Bar (not an island any more by the way…). It came and I was salivating, a beautiful soft roll about 10 inches long filled with three rashers of lean bacon, freshly fried. I took them to a table to enjoy watching my fellow Cardiff citizens about their daily life. I noticed there were no pigeons around which pleased me. What I failed to notice though was the giant seagull sat waiting on the top of David Morgan. I opened the bag with great expectation and took a sip of tea…piping hot, not too strong, not too milky…life was good. Then it happened!!! Before I had even taken a bite this massive seagull swooped down, brushing my face with his enormous wings and took my bacon roll. He dropped it about 20 yards away and then, mysteriously, the pigeons arrived and they ate it together…GUTTED! I’ll stick to the market in future…..
As Phyll saw him she pointed him out to Winnie and said that if she were ever to marry it would be to him. She could never have possibly known how prophetic those words were and how many other lives would be impacted in the years that lay ahead. Before long the handsome soldier had spotted Phyll across the crowded dance hall. He crossed the floor and asked her to dance and her head was in a whirl as they glided across the dance floor in each other’s arms. Maybe it was her gentle good looks or the striking blue dress she wore or maybe it was guiding hand of someone they did not yet know, but one thing was certain, even at this early stage, they were rapidly falling in love. Her soldier asked if she would allow him to walk her home, but in some Cinderella like parody, Phyll refused saying she had to leave early. She was on duty at the First Aid post in Grangetown and she hurriedly scribbled the phone number of the Post and handed it to the young man who had so suddenly brought this ray of sunshine into her dark life, pleading with him to ring her that evening to arrange a time when they could meet again. Jack, as her young soldier friend was called, gripped the paper tightly as she left. It was his only link with this young lady he was desperate to get to know a little better. Phyll rushed through the dark night, tonight of all nights cursing her luck that the call of duty should so cruelly tear her away from her soldier. Worse news was to come. When she got to the First Aid Post she was told that due to lack of action from the German bombers, the Post was to be closed and she would not be needed. She was sent home and would not be there when Jack rang. When he made the call some time later, he was devastated when he was told Phyll was not there and no contact number or address was known. Two sad hearts in different parts of the city longed for each other but neither knew where the other one was but both dreaded that contact was lost forever. The following Tuesday Phyll and Winnie hatched a plan. The authorities had decreed that any female worker whose boyfriend was home on leave should be allowed time off to see him. Despite not having young men serving the country, Phyll and Winnie applied for and were granted time off and decided to go dancing, Phyll hoping against hope that she would again meet Jack, but what chance? Where was her handsome soldier? Maybe he was back at his base in Salisbury, maybe somewhere in Europe. Phyll and Winnie discussed where they should go; there were many possibilities, The Connaught Rooms and The City Hall were their favourites but the lure of the Celtic was too strong, maybe just maybe…. When they entered Phyll’s eyes noted who was there or maybe more importantly who was not. The room was full of soldiers, but there was no sign of Jack. She felt so low. As time wore on she was asked to dance and was in the arms of another, when it was as if the sun had forced its way through the dark clouds and Jack her handsome soldier appeared. He too had been hoping against hope that the beauty in the blue dress would be there. When he saw her he lost no time in tapping the soldier who held her and he took her into his arms in an embrace that was to linger for the next sixty three years. At the end of the evening Jack walked her to her home in Grangetown before walking back to his home in Ely. He called early the next day and they walked the Mile Road together, both wishing in their hearts it was called the Twenty Mile Road and they shared precious hours together, they knew times like this would be so limited in the future, as the dark clouds of war still hung menacingly overhead. Many dangers and long weeks of separation lie ahead. Both knew that whatever the future held, the new love they had found was now permanently fixed into their hearts. They thought about not only the immediate future but also about the long term. Would they have a family, would they grow old together? What would they be like in their eighties? They met several more times before Jack was called away to serve his country, liberating Europe from the stranglehold of the Germans. They wrote to each other whenever they could and wherever they were and Phyll would sneak away quietly to read Jack’s letters as they arrived at her home back in Wales. One poem that Jack sent Phyll has always remained their own special secret. ‘How do I love thee? Let me count the ways…. The letters Jack received, he kept with him wherever he went. Knowing he was loved him gave him untold strength as he faced the horrors of war. 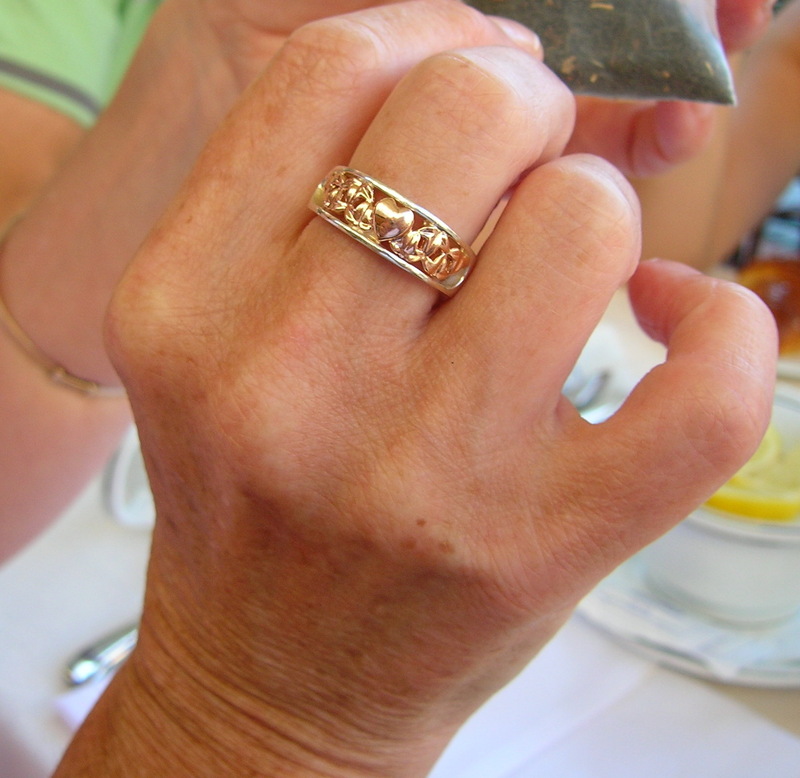 As the year changed Jack and Phyll knew in their hearts that they would be together forever and on 3rd February 1945, while Jack was fighting in Belgium, they got engaged and Fanny, Jack’s mum went into Cardiff with Phyll to buy the ring. Later the same year as the war in Europe ended the young couple looked forward to being together but their hopes were dashed as Jack was posted to Palestine for nine months. More letters followed each one bringing closer the day they could be together forever. In early 1946 Jack was de-mobbed and preparations for their wedding began. 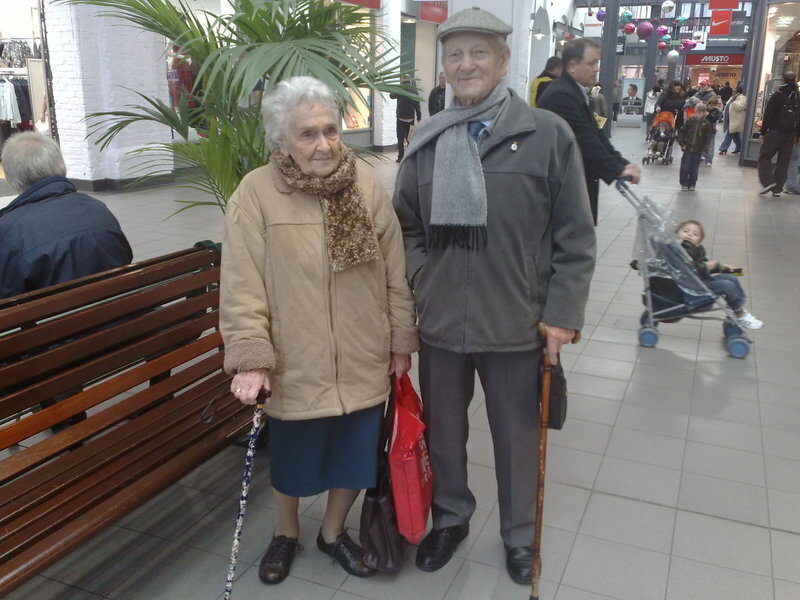 They were married at 12 noon on Saturday 29th June 1946 in St John’s Church, Cardiff. The bride looked stunning and was given away by her dad, William. Glenys and Barbara, Jack’s two younger sisters, accompanied her. Jack had asked his friend Sid Dukes to be his best man. I was a beautiful service and finally the two young people promised their future to each other come what may and knew that they would be together forever. After the ceremony the wedding party travelled the short distance to The Philharmonic in St Mary Street where all enjoyed a wonderful reception ~ as wonderful as early post-war time rationing would allow. At 11.00 pm the same day, the happy couple caught an overnight train to Cornwall where they honeymooned near St Mawes in Cornwall staying in Feock near the Punchbowl and Ladle Hotel. During the train ride they had to sit opposite each other in a cramped compartment but their exchanged glances spoke volumes about the plans they had for their future. What would it hold? Had they been able to write the script themselves they would not have dared write such happiness into their story. After some tough, very tough early days God saw fit to smile on this special young couple. He had great plans for them. After a week in Cornwall Jack and Phyll returned to their new home. They had turned down offers of accommodation from both sets of parents, so determined were they to make a home for themselves. Their first home was an attic flat in 11, Fitzhamon Embankment, their landlady was a prostitute and made life very difficult for Jack and Phyll. 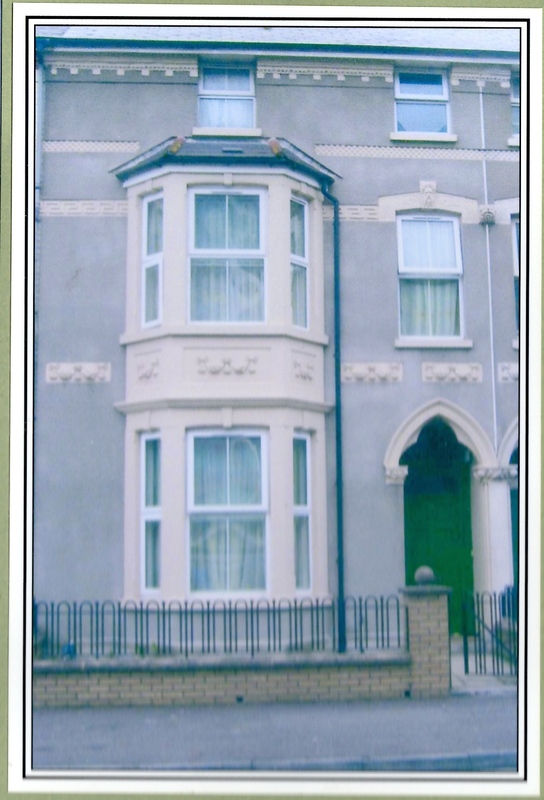 Within a year their first child arrived, born at 201, Penarth Road, Phyll’s old home. The arrival of John brought its own difficulties but the unique bond of love between Jack and Phyll was being strengthened day by day. In 1949 something happened which was to have a huge impact on their marriage and future lives together. Jack was working for a firm of building contractors in Cardiff and found himself working alongside a cheerful electrician by the name of Bill Dobbs. Bill was a Christian and during their work Bill invited Jack to attend a Big Tent Gospel Campaign being run by an ex heavyweight boxing champion called Stan Ford. Jack refused saying it was not really his scene, but a few days later after spotting an advert for the same event, Jack decided to go along. The tent was situated on the land where the Millennium Stadium stands today. Incredibly, he responded to the appeals of the evangelist and became a Christian. As he walked forward to receive counselling, who should walk towards him but the electrician Bill Dobbs. They embraced and a life long friendship ~ friends, united in Jesus Christ, was born. Jack wondered what implications his new found faith would have on his life. The following night he took Phyll to the Big Tent and incredibly, as the hymn ‘Just as I am’ was finishing Phyll stood up and committed her life to Christ. 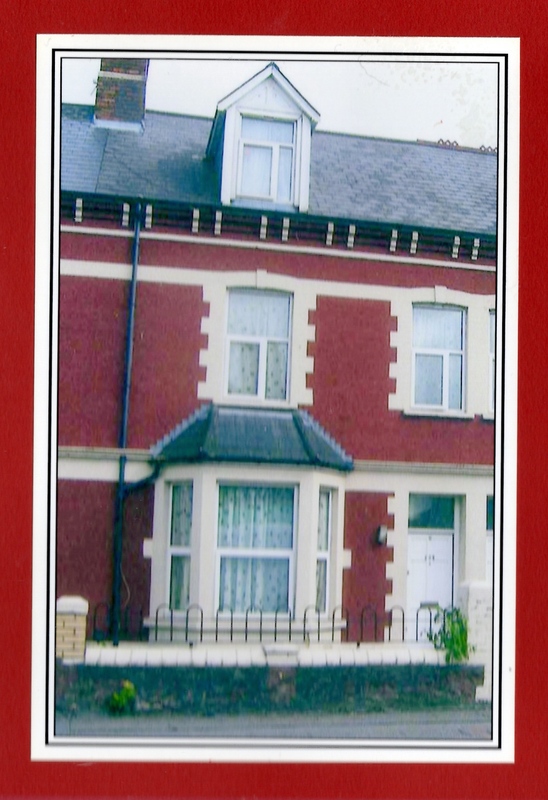 In 1949 they were able to move to a new place near Phyll’s mum at 205, Penarth Road in Grangetown and the new lower rent meant they could just about afford to buy a new bedroom suite on hire purchase. A change of landlord brought about some more very difficult times, especially when their second child, a boy called Roger William was born in October 1950. Conditions became almost unbearable and only the strength of their love for each other and their young family enabled Jack and Phyll to cope. They applied for a council house and when a council inspector called to the flat to see a bedroom containing a double bed, a single bed and a cot, as well as all Jack’s tools and equipment, a move seemed imminent. A large post war building programme out in the suburbs was under way and one glorious day Jack and Phyll received a letter from the council telling them they had been given a council house at 5, St Dogmaels Avenue in Llanishen. God was continuing His work in their lives. They moved in within minutes of the builders moving out! The sense of freedom was marvellous. Incredibly the cheerful electrician Bill Dobbs and his wife Ruby joined them within a few short weeks. They too had been moved to a council house in Llanishen, just around the corner in Fishguard Road. Within weeks a third child was born, a girl Joy Elaine. The sense of ‘joy’ in the little family was almost tangible. God was good. Up until then Jack and Phyll had been attending Ebenezer Gospel Hall in Grangetown with Bill, but since the move, a new place of worship was required and the choice lay between Mackintosh Gospel Hall or a small house based church run by Mr and Mrs Thrower at their home in 97, Fidlas Road. Jack and Phyll chose Mackintosh but always felt a little uneasy as they passed The Thrower’s. Before too long they joined The Throwers and a great adventure would soon begin which would lead to them establishing a place of worship at the very centre of the Estate where they lived. 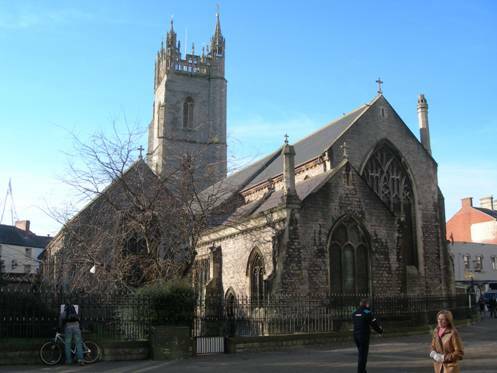 A piece of ground had been set aside as a place of worship and some Christians in Cardiff, including Jack and Phyll and Bill and Ruby and the Throwers set about establishing a church. A tent campaign led by that heavyweight boxer Stan Ford was set up. The work had started! Following the tent a more permanent building was needed. A green corrugated hut was found in Bedlinog in the South Wales Valleys and Jack, Bill, Jim Orr and a few others set about dismantling the building and transporting it back to Llanishen. The vision, hard work and determination of these young men knew no bounds. Friendships forged in those exciting days would stand the test of time. 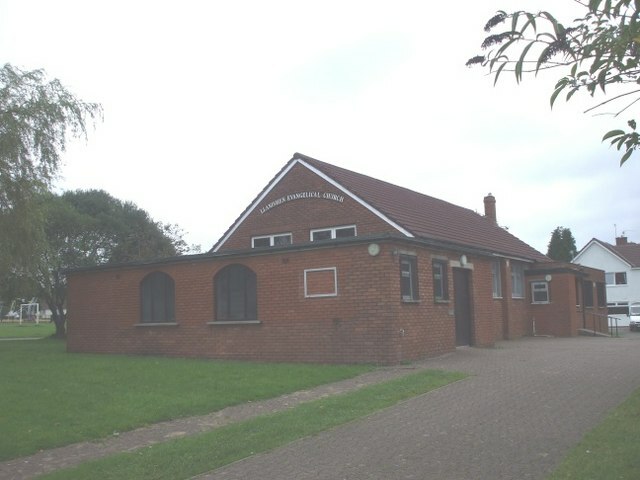 The new church, Llanishen Gospel Hall, began to grow and Jack was asked would he look after the door, he accepted and so began a humble line of service that is still continuing faithfully after fifty three years. Jack and Phyll found new friends, Charles and Eileen Hallet, Captain Tom and Mrs Dorothy Morgan, Aubrey and Lillian Roberts and Herbert and Eileen Dalling. Girls and boys’ youth clubs were set up and Jack and Phyll became involved winning the confidence of young and old alike. A new building, a permanent brick building was built in 1956. With the new building came a new name, Emmaus Chapel. Jim Orr, a builder, took overall responsibility but young and old alike, pitched in and the new building was built by and belonged to everybody. New friends came along, Arthur and Dorothy Berry, Eddie and Haulwen Hunt, Mike and Sheila Burr and John Lord among others. During this time the young people of the Emmaus were attracted to Jack and Phyll’s home and very often their house would be full to bursting with young people singing and enjoying spending time together. Many lifelong friendships were formed in those happy days. People like Lindsay and Jackie Morgan, John and Mary Patterson, Marilyn Powell, Gaynor Britton, David Jones, Mavis Adney and many others were all influenced by Jack and Phyll’s hospitality. As their children grew up through the fifties and sixties, their life was simple but idyllic. 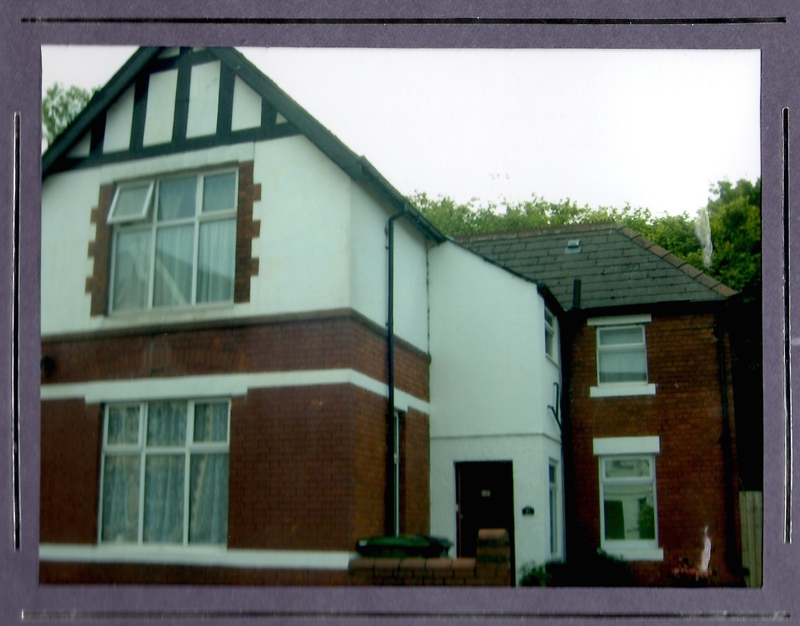 Home in St Dogmaels Avenue was always open for friends to join them. Paul Pace was just one example of friends who became a part of this unique family. They enjoyed holidays every year, visiting places like Fontygary, St Ives, Blue Anchor, Broadhaven and many places in between. 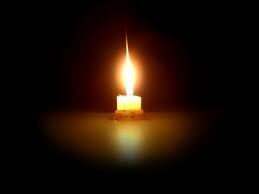 God looked after the family and Jack and Phyll’s love shone out and touched the lives of all who knew them. The first child to fly the nest was John who married Christine Cummings on 5th September 1969. Emmaus Chapel was the venue and Herbert Dalling conducted the service. It was such a good day and a milestone for The Newberry family. 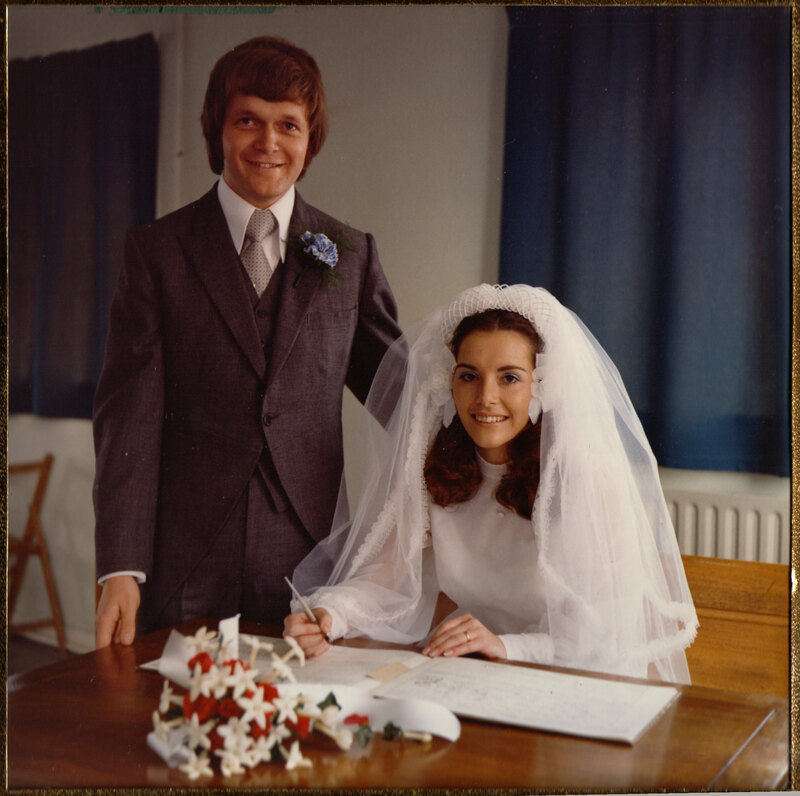 Jack and Phyll celebrated their twenty fifth Wedding Anniversary on 29th June 1971. Joy, the only girl in the family, married Douglas Reed on September 22nd 1973. Eddie Hunt conducted the service and the reception was held at Cardiff Castle. Roger married Jean Musgrove on 11th October 1975. Charles Hallet conducted the service and again Cardiff Castle was the venue for the reception. The family home was now empty and Jack and Phyll discovered a new freedom. They adapted by opening a flower shop in Grangetown. It meant Phyll leaving her job in the Inland Revenue. In due course Jack left his job in the Department of the Environment and soon both were working in the business. They enjoyed each others company and their love continued to blossom and proved an inspiration to their children as they started to build homes and new families of their own. They were still committed to the work of Emmaus and over the years new friends joined, Norman and Ann Curtis, Roy Shears, Muriel Lampert and in recent years, Peter and Olive Shin and their girls, Lisa Stavsky and Michael and Joy Dibua. They celebrated their Golden Wedding Anniversary on 29th June 1996 with a family celebration at The Farmer’s Daughter Restaurant. As time went on, advancing years brought with them time for reflection and appreciation of how God had dealt with them. His hand was leading and guiding them even before they knew Him. Many lives had been touched. As they celebrated sixty years of happiness family and friends gathered to show their love and affection and to pay tribute to a remarkable love, a love that has impacted the lives of so many people. How do I love thee? Let me count the ways… and they will both decide that is an impossible thing to do. It is impossible to count the ways they love each other, impossible to measure how much they think of each other and impossible to put a value on something so very precious. Their future was in the hands of God who sixty years ago brought those two young people together, the same God who had guided, protected, cared for and loved them and allowed His love to shine out touching the lives of all who knew them. The future turned out to be a time of calm quiet reflection for them both. During the few years that followed God gave them three more years together. Advancing years slowed them down but they remained able to look after themselves. Mum loved her garden and as each Spring came around the seeds would be planted and new life would begin again. All our homes bore testimony to her skills. Dad loved the Spring when the daffodils appeared, he would say that the daffodils looked like they were trumpeting in the warmer weather. Each Saturday, we were drawn to the family home and each Saturday mum would have food ready for us all, as usual nothing was too much trouble for her. She set us a wonderful example of the importance of hard work and how to love and care for the family she loved so much. 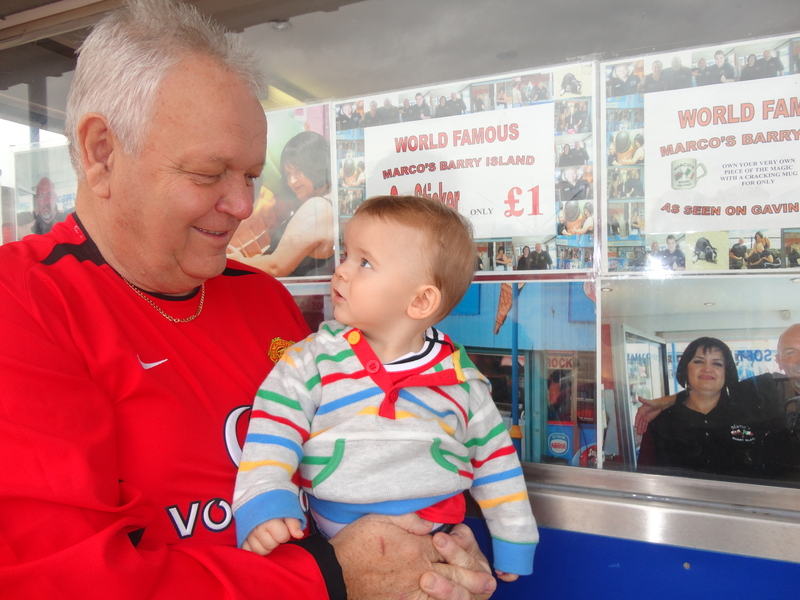 More great-grandchildren came along…they loved Jack Noah, Rueben, Ben and Zak and loved it whenever they came to visit. We were never quite sure how they did it but as the family grew so did their love. They never loved us less as there became more people to love they just drew on their deep reserves and each from oldest to youngest knew how special they were and how much they were loved. In March 2009 they rejoiced with Gareth and Keri with the news that a new great-grandchild was coming. 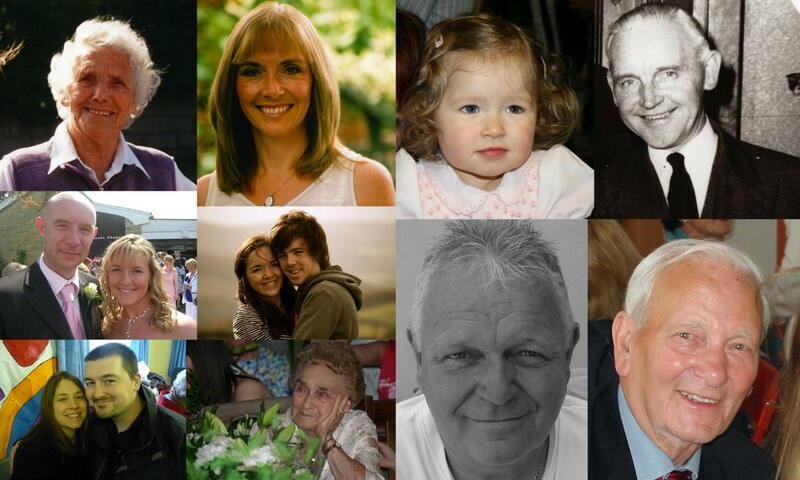 We all knew one awful day the family chain would be broken and on 22nd August 2009 our dear father was called home. The end came very quickly after short illness. John, Joy and mum were with him when he went but Roger, Jean and Bethany were in Canada on holiday and needed to arrange emergency flights home to be with the family. We were all devastated but needed to be strong for mum. A wonderful and moving service of thanksgiving for his wonderful life was held at Llanishen EvangelicalChurch on Thursday September 1st 2009. Dad was buried at Thornhill Cemetery. The parting was devastating! 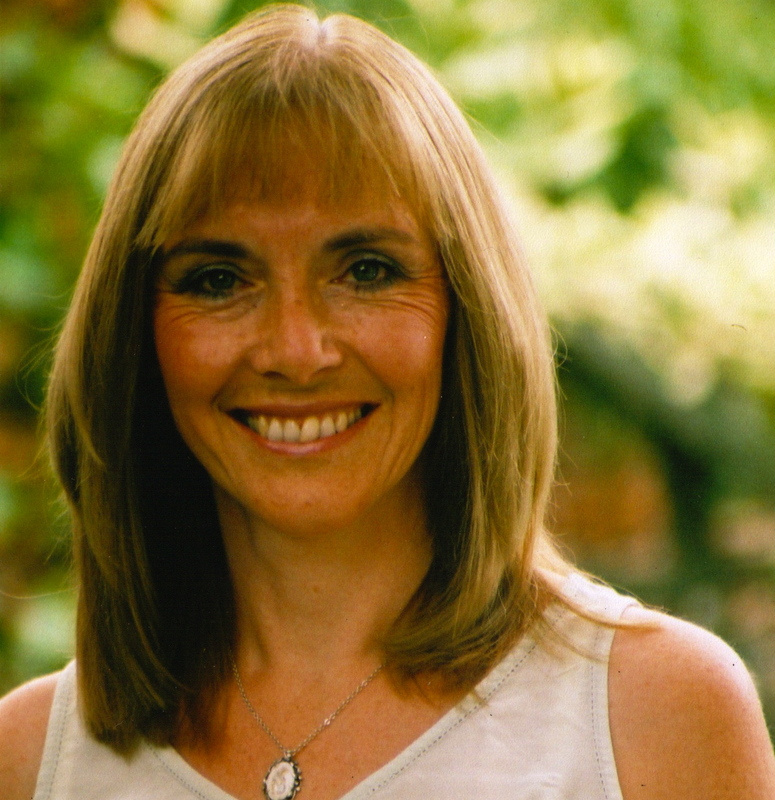 We all feared for mum but she remained amazingly strong…maybe she did it for us! There were times when our grief almost overwhelmed us, but our hope as Believers that one day we will see him kept us going through those dark days. In October 2009 Roger and Jean had arranged for mum to have a holiday in West Wales and as John was taking her down, she suffered a massive stroke near her spinal cord. She was admitted to The University Hospital of Wales for emergency treatment. Sadly our dear mum never returned to the family home. She grew a little weaker each day but shortly after Christmas was delighted to hold baby Mia, daughter of Gareth and Keri and her sixth great-grandchild and first great-granddaughter. It was almost as if she were waiting for Mia to arrive as shortly afterwards on Monday 4th January 2010 mum left us to be with dad. Amazingly Roger and Jean were with her as she went, it was as if God meant it to be as they were so far away when dad died. We thanked God for her wonderful life in another special service at Emmaus Chapel on Monday 18th January and she was laid to rest with dad at Thornhill. Two crosses stood on the spot side by side in the ground mirroring the way these two great people stood side by side in life. They were inseparable in life and they will be inseparable in death. The love story, which had begun so many years before continues both in heaven and in the hearts of all of us who loved them. Our lives have been moulded by their unique love and a huge responsibility is now ours to continue their remarkable love story in our own lives… to work as they worked, to devote our lives to God as they devoted their lives to him and love as they loved. My dad – John Charles Newberry. An appreciation of his life. Our father was a great man. In the eyes of the world he was just a simple carpenter but to us he was a great man. It has been said that…in life we shall find many men that are great, and some that are good, but very few men that are both great and good. Our father was both. He himself, of course, would never, ever have accepted such a description. He was a humble man; who lived simply and loved a lot. 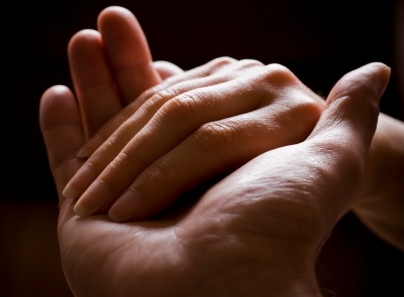 He didn’t have much, but he shared what he had with just about anyone who was in need. His sole aim in life was to be like Jesus. Today as we reflect on and celebrate his wonderful life we will see that he went some way to achieving his aim. He was a great man because of the way he loved our mother. It is impossible to speak of our father without also speaking of our mother, because they were one. Together, they showed us what true love was like. They met in the dark days of World War Two in a dance hall in Cardiff, while he was home on leave from serving his country. God obviously brought them together and despite many difficulties and dangers their romance blossomed and as soon as they could, at the end of the war, they married. God blessed them with sixty three wonderful happy years, three children, eight grandchildren and five great grandchildren and each one adored this wonderful man. Every day of their married life dad tried to love our mum ‘as Christ loved the church’ totally… selflessly… and with all of his heart. Their love story is unique and is an inspiration to us all. They lived for each other and many lives, over many years, have been touched for good by this special couple. He was a great man because of the role model he was for us his children. He was caring, hardworking and devoted to us. Dad loved us all much more than he loved himself. We never once doubted his love. He told us whenever he saw us. When times were tough he would carry off-cuts of wood home from the building sites on the handlebars of his bike to help keep our home warm and his cry of…’Dad’s home’ would bring us running to greet him at the side door of our house. On a Friday he would have Wagon Wheels or some other kind of treat hidden somewhere on him and we would have such fun finding them. They were our treasures given from his heart of gold. Our childhoods were idyllic. We played in the garden, the street and the local woods, building dams and catching fish and at the end of each day we came home to his strong but gentle arms. He helped us realize our dreams, forgave us our mistakes and loved us whatever. We never needed to earn his love and affection…he gave it freely and in generous amounts. On the edge of a £2 coin are the words ‘Standing on the shoulders of giants’, a phrase attributed to Sir Isaac Newton as he paid tribute to the work of those who had gone before him; as his children, if we are able to achieve anything in life its because we have been standing on the shoulders of a giant…our dad. He was a great man because of his relationship with his grandchildren and great grandchildren. He had a wonderful way of developing a unique relationship with each one. He took an interest in everything each one did, whether it was hearing about things that happened in school or insisting we put the phone near so he could hear them practice the piano or the double bass and even after they had grown up, he listened attentively to tales of travelling or job interviews or promotions. Each one remembers him for the funny little signs of affection, whether it was a funny handshake or a ruffle of the hair. Each had special names for him such as ‘guv’ and ‘silly old fool’ and ‘Goozer’. He danced with them in their happy times, cried alongside them in their sad times, but was always the rock on which they could depend. He was a great man because of the way he served his country. It was the part of his life he rarely shared with anybody. Dad was 18 years old on 10th August 1939 and war was declared on 3rd September 1939 and he received his call up papers the following day. On 6th June 1944 during the first hours of D-Day, our father was parachuted into Normandy near the site of Pegasus Bridge, as he served our country helping to liberate Europe. He went on to serve in Holland, Belgium, The Rhine and as the war ended, as he was looking forward to being with his beloved Phyll, he was posted to Palestine for a tour of duty. This lasted almost a year. He returned to Normandy with his family in June 2004 to celebrate the 60th Anniversary of the D-Day landings and was overwhelmed by the welcome and the gratitude he and all the other veterans received from the French people for helping to free their country from the tyranny of oppression. He was awarded a commemorative medal by the people of Normandy. He was proud of it, but kept it at home in a box and never showed it off. 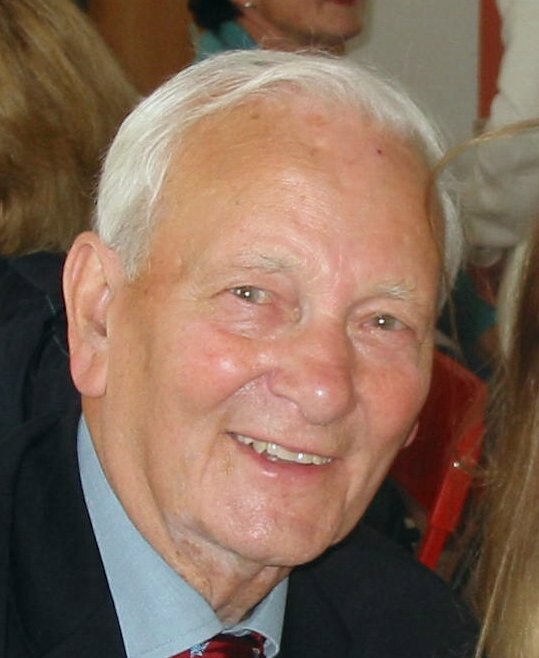 Although his poor health prevented him from attending the recent 65th Anniversary Celebrations, he was represented by family members and was awarded a special bar to attach to the medal he received in 2004. He was a great man because of his devotion to his church. Dad became a Christian in 1949. 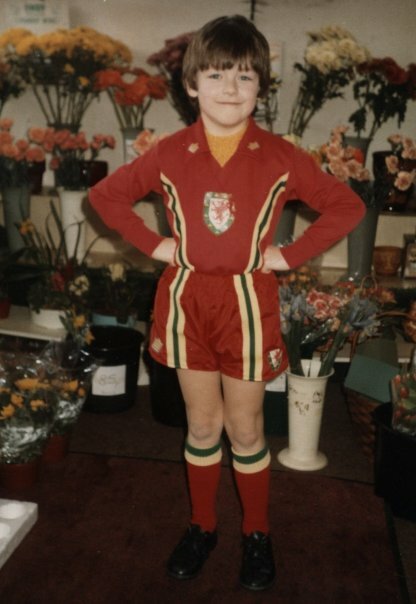 He had been invited to a big tent meeting, which was held where the Millennium Stadium is today. He had been invited by his friend Bill Dobbs and in the days that followed our mum took the same decision to follow Christ. Since that time, both their lives have been devoted to following the Lord and working as part of the local church. 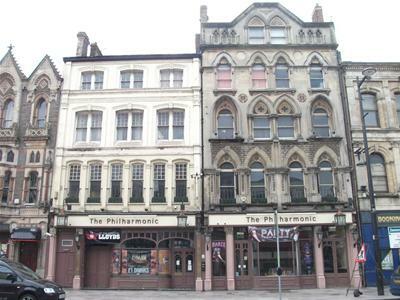 In the early days of his Christian walk, he would spend every Saturday working with the Cardiff Tract Band and he and his friends would visit valley towns and share with them through leaflets and open air services the Good News that Jesus can make a difference and he knew the difference for himself. Soon after they moved to Llanishen in 1952 they helped to organize a mission in a big tent. It was on the site we are all sitting now. Following the mission a green corrugated hut was purchased and dad with a group of local Christians dismantled it in Bedlinog in the valleys and rebuilt it here in Llanishen. When the chapel opened, Dad was given the job of welcoming people on the door; a job he was ideally suited to with his warm smile and firm handshake. Amazingly it was a job he did until he was called home… more than 56 years of unbroken service. What an example to the generations that followed! During that time he must have welcomed countless thousands of people. He treated everyone the same… strangers, friends, young or old it made no difference…..each one received a handshake, a smile and a word of welcome and encouragement. When we all get to heaven you can be sure hovering near the entrance will be our dad, smiling, hand extended ready to welcome us in and tell us how good things are inside. Dad and mum ran Boys and Girls Youth meetings in the evenings; teaching children and young people many different craft skills and sharing with them the truths of the Bible. They made their home available to the young people of the church and week after week on a Sunday evening their home would be filled with youngsters, chatting, singing and drinking endless cups of tea. One of the young men actually came to live with us – this selfless act of love showed the devotion dad and mum had to their church and their God. I would rather be a doorkeeper in the house of my God than live a good life in the homes of the wicked. He knew the jobs that God had entrusted to him and he did the best he could every day of his life. He was a great man because we never heard anyone speak ill of our father. It’s common at a funeral to only remember the good things, to omit the things that could embarrass. In our father’s case, the most remarkable thing that can be said is that there is no bad. It may or may not be true that the traffic is moving a little quicker around the north Cardiff area these days, yes…we all agree that he may have been a slow and careful driver, but the truth is dad never had an accident, never had a speeding ticket or even a parking ticket in over seventy years of driving. Sometimes it took him over an hour to walk the short distance to buy his morning paper, because when he met someone he always stopped and talked with them and he was always interested in what they had to say. He was loved by everyone in the small community where he lived. Many of them are here with us this morning. It is said….He is greatest whose strength carries up the most hearts by the attraction of his own. Our father had a heart for people. He was greatly loved and will be greatly missed by us his family, his fellow believers here in Llanishen and across Cardiff and also by his many friends and neighbours. His passing will leave a huge hole in the lives of all who knew and loved him. For us, the family chain has been broken, but we have the wonderful hope that dad is the first link in a new chain in heaven and one by one as we join him that new chain will link up. We don’t like to say good-bye to those we love. But if what the Bible says about heaven is true, and we believe it is, then the ultimate prayer, the ultimate answered prayer, is heaven. It is right for us to weep, but there is no need for us to despair. Dad had pain here. He has no pain there. He struggled here. He has no struggles there. We might wonder why God took him home. Dad doesn’t! He understands. He is, at this very moment, at peace in the presence of God. Suddenly on 22nd August 2009 Jack, adored husband of Phyll, precious dad of John, Roger and Joy, dearest father in law of Chris, Jean and Doug, treasured grampy of Lisa, Helen, Kate, Jason, Gareth, Keri, Bethany, Simon, Tamara, Mark, Emily, Paul and Amy. Grampy Newbs to Jack, Noah, Reuben, Ben, Zac and baby Newberry to be. Loved also by Russ and Alex. A Thanksgiving Service to celebrate his wonderful life will be held at Llanishen Evangelical Church (Emmaus Chapel), Heol Merlin, on Thursday 3rd September at 11.00 a.m. Afterwards at Thornhill Cemetery. Family flowers only please but donations in lieu to Echoes of Service, c/o Mr. A. Berry, 13, Hurford Place, Cyncoed Cardiff. Welcome to my world of blogging! Hope you have as much fun reading them as I do writing them. I am motivated bu the verse in the Bible which says…This is the day that the Lord has made, let us rejoice and be glad in it!